Sunday service withdrawn - replaced by Route 43A which ran from Friern Barnet to Croydon Airport. Sunday only Holloway (J) allocation introduced. Most of Sunday only J allocation returned to MH. Sunday Muswell Hill allocation withdrawn again. 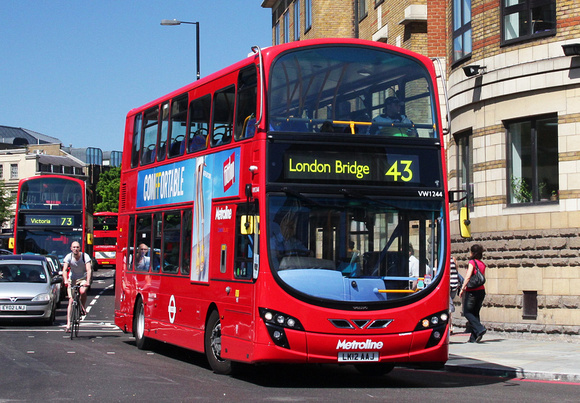 Sunday Route withdrawn - replaced between Highgate and London Bridge by revised Route 133. Mon-Fri evening Route introduced - SAT afternoon Route introduced. Route increased as part of trolleybus replacement program. Saturday afternoon Route withdrawn between Angel and City Road. Finchley allocation withdrawn and Muswell Hill converted to RML operation. Restored between Hampden Road and Friern Barnet . Muswell Hill garage closed - allocation transferred to Holloway (HT) and reverted to Metrobus operation. Sunday Route re-introduced after 33 years - partly replacing Route 263A which was withdrawn. Sunday extended from Muswell Hill to Friern Barnet and from Liverpool Street to London Bridge. Conversion to low floor double deck vehicles. Sunday diversion via Old Street and Liverpool Street withdrawn. Enviro 400 appearances common from this date - due to loss of Route 24 contract.